Chora Sfakion (Sfakia) , with 350 ihabitants, is located at a distance of 74 km. south of Hania and is built at the center of a hidden cove in an area noted for the wilderness and the remoteness, which - as it is said - reflects in the personality and character of its inhabitants. Those courageous and free spirited people turned to the sea in order to make a living and for many years they chose to be sailors and commercial traders. Sfakia have always been connected with the great moments of cretan history. During the Venetian occupation the village had great financial development and the number of its inhabitants rose to 3000. At that time its fortress, Castelli, was built, becoming also the home of the local Venetian governor. Although the failed insurrection of 1770 was "drained in blood" the townspeople never gave up and kept fighting the Turks at every opportunity given. On May 31st, 1941, the little port of Sfakia was used - with the help of the villagers - by New Zealanders and Australians who had remained behind the main allied forces, in order to escape. Today, among the houses in the village, you will find many 300 to 400 year old mansios, testifying to its glorious history. Starting out from Sfakia it is worthwhile to pay a visit to the Church of Panagia of Thymiani, to the village of Komitades as well as to the legendary Fragokastello. Online Travel guide with the best accommodation in Sfakia. Find the cheapest hotels is Sfakia & get exclusive online deals. Great rooms at bargain prices. Book online now! Compare Hotel Prices and read Reviews from others. Great Hotel rates and information See photos, reviews & what's nearby Sfakia . 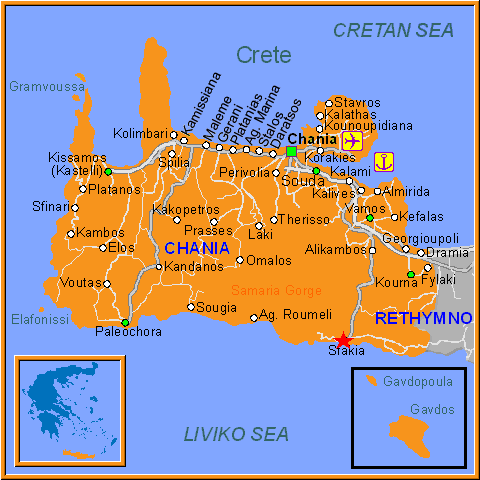 Detailed tourist and travel information about hotels of Sfakia providing also regional information.